Old Man Emu FJ40 suspension components are perfect for those who want ride quality over 'show' quality. You may find taller or more heavily advertised suspension lifts on the market, but you will never find anything that ride more comfortably, has greater load capacity, or is more durable than Old Man Emu. If you truly are looking for the 'best' suspension and not just the most popular or one that temporarily sits an inch taller (most lifts sag quickly, not OME), then you have found the very best suspension on the planet for your Toyota. The Toyota Landcruiser is well known as THE classic 4WD vehicle on the planet. As good as it is though, ARB can make it better. Pictured to the left is an Old Man Emu outfitted Cruiser. 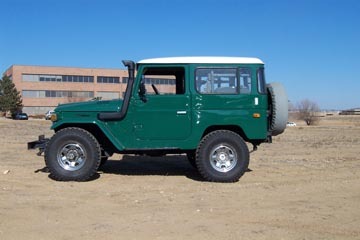 Also available from rocky Road are Safari snorkel, ARB Bull Bar, Safari rack, and ARB Air Lockers! No need to look any further, Toyota owners know that Old Man Emu/Dakar is the only suspension worthy of their vehicles. 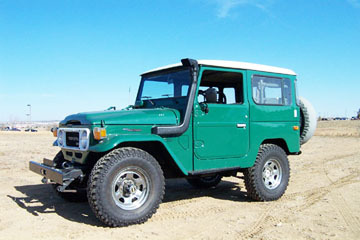 Scoll down to the lower portion of this webpage for additional information on the Old Man Emu suspension lift kits for Toyota 40 Landcruisers. Old Man Emu/Dakar lifts are listed below. Some folks might ask why OME/Dakar suspensions are not available in taller lifts? OME/Dakar's philosophy is quality and sensibility without complications. OME/Dakar sizes their lifts such that there are no problems or modifications required to steering, braking, or drivetrain. Any taller and these items do become an issue. For most people, the extra inch or so isn't worth all the headache and cost necessary. Do it right the first time with OME/Dakar!